Hey! Funny to see you here! I am only here for a minute to let you know that I am guest posting over at Mal-Diction (click here) today. I am truly flattered to be gracing the pages of a blog written by an English graduate student. Lawduhmercy! You know I ain’t always talk RAHT, so I am just tickled pee-yink, I tell ye! I feel inspired every time I visit Jessica’s fun spot on the internet. I am glad to have the chance to direct you all her way. The topic of the guest post, you ask? I meant to spell it that way, too. You will have to get to clickin’ to see what THAT’s all about. 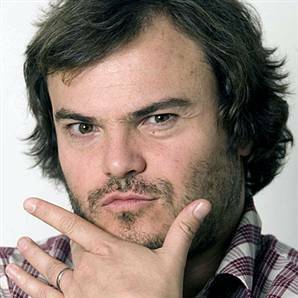 But before you do, say hello to Jack Black. He absolutely cracks me up even when he’s not saying anything. That guy’s got some screws loose and I LIKE IT! While I was looking for his picture, I came across a website titled “10 Celebrities Most Likely to Have a Napoleon Complex” due to their height. I am 5’9″ and am either taller or the same height as Seth Green, Jack Black, Mark Wahlberg, Sylvester Stallone, Daniel Radcliffe, Tom Cruise, Bono, Robert Downey, Jr., Bow Wow & Mark Anthony. I find this odd. I thought Sylvester Stallone was taller.